The homeware and furniture industry has been doing well for the past couple of years, and we expect this trend to continue. The annual expenditure on furniture per US consumer was $502 in 2015 (up from $386). Meanwhile, a report by Furniture Insights found that furniture orders for February 2017 were up 4% from last year. These numbers spell great news for homeware retailers because they clearly indicate that consumers will continue buying items for their homes. The question is, are you effectively attracting and converting these shoppers? If you aren’t enthusiastically nodding your head to the question above, keep reading. In this post, we’ll take a closer look at the successful strategies of the world’s top homeware retailers. One of the secrets to IKEA’s success as a homeware retailer is that they put research at heart of their operation. And this is a strategy that all retailers — whether they’re selling low cost or high-end merchandise — can learn from. IKEA devotes tons of time and resources studying the cultures and habits of their target markets. For instance, Fortune reports that the company once did a study of 8,292 people in eight cities to learn more about their morning routines. Doing so enabled IKEA to figure out what stresses people out when getting ready for work and what keeps them from getting out the door during the morning rush. IKEA gained valuable insights from their study and it helped them come up with a product called the Knapper, a full-length mirror that comes with a built-in rack and hooks for hanging clothes and jewelry. 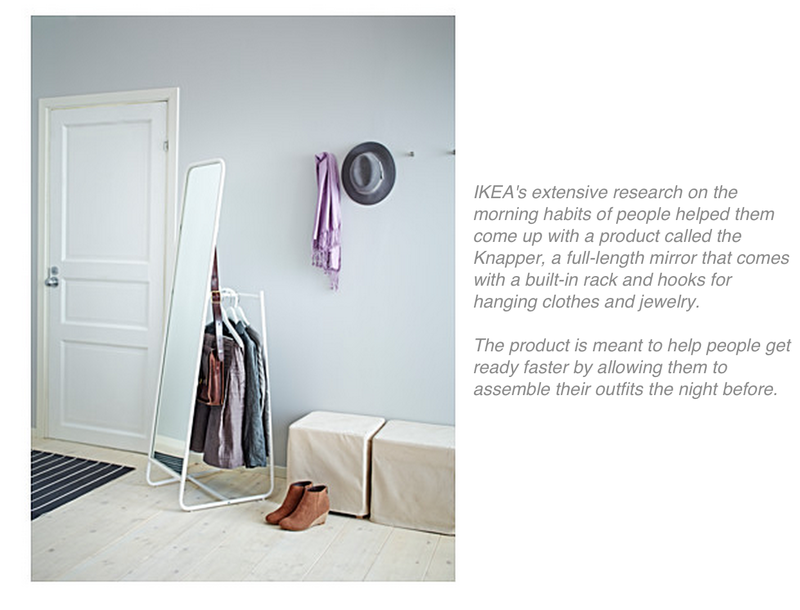 The product is meant to help people get ready faster by allowing them to put together their outfits the night before. This strategy helped them see how people are using their products. For example, they learned that their customers in New York use sofas differently from people in Milan or Stockholm. Intensive market research pays off. And while you don’t have to go through the lengths that IKEA did, we hope you can apply some of their strategies in your own market research. You can, for example, try to learn more about the day-to-day habits of your customers and see if you can start buying or designing products that would make their lives easier. If you have multiple locations, you can take a closer look at distinctions that each market has. Your customers in say, Australia could be using your products a bit differently from shoppers in America, which means you’ll have to market and present your products to appeal to different markets. Furniture retailer West Elm managed to transform from a boring and unprofitable store chain to Williams-Sonoma’s fastest growing brand. It accomplished this by humanizing its products and stores. Here are some of the steps the company took to turn things around. The first thing the West Elm president Jim Brett did when he took the reigns in 2010 was to revamp the company’s product lines. According to FastCompany, Brett got rid of their “spiritless” (i.e. dull) products and sourced merchandise with more personality and stories behind them. He “remerchandised the stores and catalogs to convey a sense of creativity and discovery,” and invested more in handcrafted products. See if you can do the same thing in your store. If sales are flat, it could be because your products aren’t vibrant or unique enough. Perhaps it’s time to spice things up by introducing exotic designers or sourcing from new artists. Brett also transformed West Elm’s locations from mere “stores” to “community hubs,” by encouraging associates to forge genuine relationships with their customers. Rather than just selling them stuff, for example, associates and consultants could recommend great restaurants or other establishments. In addition, West Elm started running classes that encouraged locals to gather ‘round and learn new skills. These classes were non-salesy; instead of trying to subtly push people into buying products, West Elm focused on strengthening their local communities. West Elm also launched a home-decorating service wherein a consultant would come to a customer’s home for free and help them pick out products—even if those items didn’t come from West Elm. This may seem counter-intuitive, but it worked great for the company. It allowed them to build trust with their customers and helped them increase their social presence. More than ever, customers want compelling shopping experiences. It’s not enough to push “stuff”, you need to offer unique in-store experiences that they can’t get in other channels (i.e. ecommerce, mobile) or shops. One of the most effective ways to accomplish this is by humanizing your brand, products, and store. Start by personalizing how you interact with customers. Have your associates get to know them better and engage with them in richer ways. Another strategy is to introduce more interesting product lines — ones that are unique and come with stories. You can also build living, breathing communities around your stores through events, classes, and more. In a nutshell, humanizing your brand boils down to one thing: don’t be a robot. Treat your customers like the unique, individuals that they are. One of the best examples of a homeware retailer doing omnichannel right is Crate and Barrel. The company is aware that shoppers often switch from tablet to smartphone to desktop when browsing, so they’ve made it easier for users to switch from different channels when shopping on their site. When users are logged into the Crate & Barrel site, the products that they’ve browsed are saved into their account, so they can easily switch devices and pick up where they left off. The company also carries out the same seamless experience with their gift registry app. 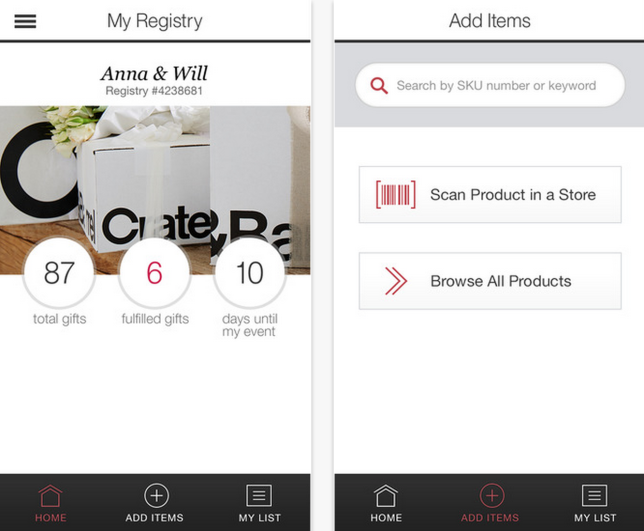 Users are able to create, manage, and monitor their gift registries from multiple channels, allowing them to easily stay on top of things no matter where they are or what device they’re using. Customers are researching, shopping, and buying across multiple channels, which means you have to be present at every touchpoint. This is especially true for retailers in the home furnishing space because such stores usually carry big ticket items that require plenty of research before arriving at a decision. It’s not uncommon for shoppers to move from one channel to the next (ecommerce, brick-and-mortar, mobile) and back when shopping around. That’s why it’s incredibly important for you to be there for them across all those touchpoints and move them towards the right path to purchase. As soon as you walk into a PIRCH store, a staff member immediately offers you a drink that you can enjoy while browsing the shop. 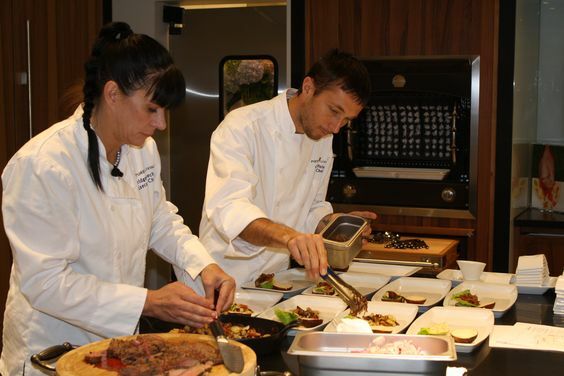 Additionally, many PIRCH locations have professional chefs that prepare food and offer free cooking classes using the store’s merchandise. Doing so not only allows PIRCH to demonstrate their products, but it also engages customers and gets them to stick around. Nearly everything that’s displayed in the store — including showerheads and fixtures — works. This allows guests to not only see or touch PIRCH’s products, but it enables shoppers to fully experience them. 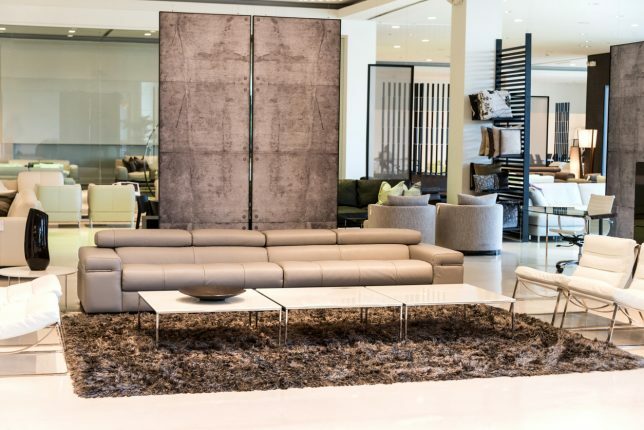 This strategy doesn’t just set PIRCH apart from online stores, it also differentiates the retailer from other homeware stores which showcase disconnected and “display only” fixtures. PIRCH’s website does an amazing job showing off its offline stores. Most online retailers simply list their the address and contact info of their physical stores. Not PIRCH. In addition to providing basic store information (i.e. 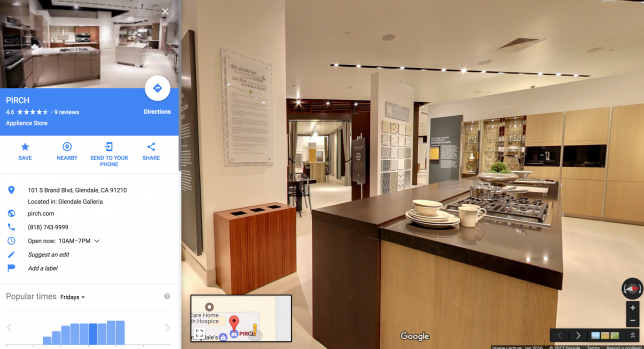 address, phone number, store hours), their website also lets users take a virtual tour so they can see what the inside of the store looks like. He mentioned PIRCH as an example of a retailer doing a great job at this. Check out their store display above, which features a sign reading “Remember the day you rode without training wheels?”. The display is compelling because it brings up feelings and memories in customers. 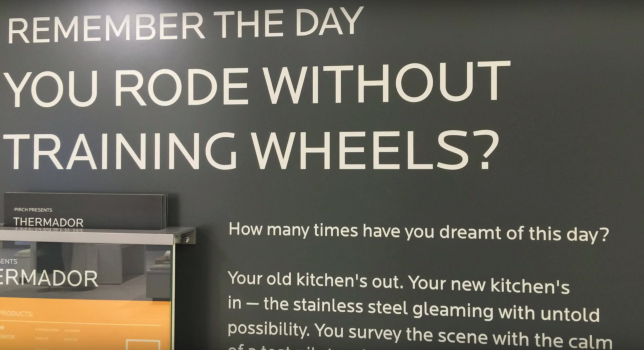 Many of us can remember how we felt when we rode without training wheels for the first time, and PIRCH cleverly taps into those feelings through their display. Strive to do something similar in your business. Go beyond generic signage and marketing materials, and instead create something that can evoke powerful emotions in your customers. Doing so will grab their attention, make you more memorable, and even convince them to buy. Stimulate people’s senses and emotions. Don’t just cater to their sense of sight and touch — figure out how to reinvigorate their sense of smell, sound, and taste. And remember, shopping can be an emotional act, so evoking the right feelings in your customers can help improve their in-store experience. While the examples in this post focused on retailers in home furnishing industry, the topics we talked about—market research, humanizing a brand, and omnichannel—apply to all types of stores. That’s why homeware store or not, we hope the pointers above gave you some inspiration on how you can take the customer experience to a while new level. How have you transformed the experience (or even lives) of your customers? Tell us in the comments. 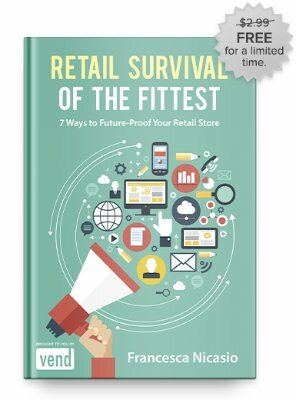 If you enjoyed this post, you may want to check out our free ebook, Retail Survival of the Fittest. This book serves as your practical guide to modern-day retail success. Learn how to use mobile technology, big data, and other digital tools to improve your brick-and-mortar store and ensure that it is well-equipped to engage and convert today’s savvy shoppers. The post Want to Create Amazing Customer Experiences? Learn From These 4 Homeware Stores appeared first on Vend Retail Blog.